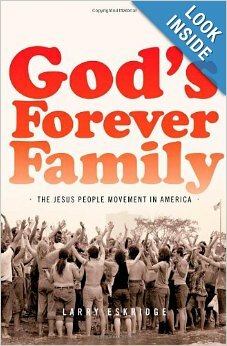 That’s one (of several) questions I asked myself while reading this interview with Larry Eskridge, scholar and author of a recent groundbreaking study of the Jesus People Movement of the 1960s and 1970s, God’s Forever Family: The Jesus People Movement in America. I’ve had a copy of Eskridge’s book on my desk now for about seven months, and I’m hoping to include it in a review essay I’m writing for Brethren in Christ History and Life, which is intended to draw together new books in Evangelical studies, review them, and ultimately gauge their significance for Brethren in Christ history. So that background sharply affected the way I read Eskridge’s interview on Religion in American History, one of my favorite American religious history blogs. A recap of the interview and some thoughts on the significance of the Jesus People for the Brethren in Christ, after the jump. Stephens: How influential do you think these countercultural evangelicals have been in shaping American Christianity? Eskridge: Well the book argues that they were surprisingly important in shaping the nature of American evangelicalism and—by reason of the growth in evangelicalism’s organizational, cultural, and political influence in subsequent years—a larger force within the overall history of the ‘60s and ‘70s than has heretofore been thought. In many ways I believe you can’t have a real handle on that period—especially on the youth culture of that era—without acknowledging the Jesus People as one of the important aspects of what was going on. In terms of the American church there were obvious institutional outgrowths—the growth of the Calvary Chapel network of churches and its offspring the Vineyard, for example. But the larger impact was felt at the grass roots level in the manner in which the movement modeled a different relationship with popular culture and youth culture. Before the Jesus People evangelicalism had a very nervous, if not downright oppositional, relationship to “worldly entertainments” and all the allures of popular and youth culture. The Jesus movement, however, was much more comfortable in baptizing popular/youth culture and making a Christianized version that could be put forward as a means to both evangelize unbelieving youth and build up the kids who came from evangelical homes and churches. There was, and still is, opposition to this way of handling these boundaries between “the World” and “The Church,” but to a large degree, the Jesus People marked a revolution in handling these relationships. 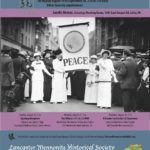 In terms of the particular historical moment, the Jesus movement’s biggest bottom line was in generational terms: it played a major role in keeping evangelicalism together by providing a much easier path for a lot of people—particularly evangelical kids raised in the church—to navigate the massive changes that buffeted American society and culture during that period. The Jesus People had a degree of “with-it-ness” and a cultural cache that the larger movement certainly didn’t possess going into the late ‘60s. I think it’s fair to say that if the Jesus People hadn’t come along when they did the evangelical church would have been nowhere near as formidable a force throughout American culture come the 1980s and beyond. Stephens: You spend some time focusing on Christian rock. How did this genre emerge when and where it did? 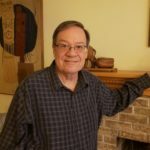 Eskridge: Music was such an important element in what held youth culture together by the 1960s that it would have been truly surprising if any sort of popular movement could have had any grass roots traction without a musical component. The Jesus movement was certainly obsessed by music just like the larger youth culture—”Jesus Music” seemed to naturally pour forth in the form of halting, homemade folk songs and bluesy, rock tunes from the earliest manifestations of the movement all across the country. A whole network of musical groups and venues grew up within the space of a few short years along with the infrastructure to distribute the music to Jesus Music fans. Of course this was all surprising in that the music of the Jesus People was an obvious departure from the norms of the larger evangelical subculture. Certainly there was no shortage of resistance among older, more traditional church people to the new forms of music. But the combination of cultural crisis, earnest Jesus People fervor, and the sheer size of the generational cohort eventually served to lessen most older evangelicals’ opposition. I think most adults in the churches saw that it would be a better alternative to cultivate their kids’ enthusiasm for Jesus by indulging their new worship choruses on Sundays and letting them listen to Jesus Rock in their spare time. If Eskridge’s claims are correct, than the Jesus People Movement played a critical role in introducing “youth culture” concerns to the larger Evangelical world — from youth-focused church events to the introduction of worship choruses into Evangelical church services. Evangelicals — especially since the 1940s — had been paying attention to the needs of young people, creating para-church organizations like Youth for Christ and Young Life that could provide Evangelical teens and young adults with “safe” alternatives to mainstream cultural youth programming. But those programs were — as I’ve said — “safe.” They were directed by adults for teens. Much of the programming was derived as adults determined what kids “would like.” As a result, in retrospect, much Youth for Christ programming in the 1940s and 1950s seems paternalistic and trite, especially to contemporary eyes. But the Jesus People Movement was different. It emerged as a dynamic movement guided equally by young people (like Lonnie Frisbee, the hippie-looking Jesus-preaching icon of the movement) and older, established Christian leaders (like Chuck Smith). It was much more open to borrowing from secular youth culture, “baptizing (to use Eskridge’s words) or Christianizing what was seen as acceptable. This process led to the introduction of folk and rock music into congregational worship, a practice that has accelerated in recent years and has now become ubiquitous in most Evangelical Protestant churches. So what does any of this have to do with the Brethren in Christ? The Brethren in Christ were decisively transformed by the Evangelical movement of the 1940s and 1950s, and its attendant focus on young people. As I’ve written in my recent article “Beyond ‘Indianapolis ’50’: The Brethren in Christ in an Age of Evangelicalism” (Brethren in Christ History and Life, December 2013), the Brethren in Christ’s increasing investment in the mid-20th century Evangelical movement had an effect upon its focus on young people. The 1950s saw the emergence of the Brethren in Christ’s branded youth program, Christ’s Crusaders — a program not-so-subtly modeled on Youth for Christ and other Evangelical para-church youth organizations. Christ’s Crusaders featured rallies (like Youth for Christ rallies), strong preaching (like Youth for Christ events), and often pop culture elements previously rejected by the conservative church (such as movies and popular instrumental music, such as that used in Youth for Christ events). It had its own logo. And its yearly assemblies at General Conference often featured Youth for Christ speakers (like 1954’s keynote speaker Bob Cook, founder of Youth for Christ). That’s not to mention the fact that many Brethren in Christ congregations encouraged young people to participate in local Youth for Christ events, nor to mention that Brethren in Christ leaders subscribed to Youth for Christ periodicals, endorsed Youth for Christ activities, or attended Youth for Christ gatherings such as the annual one held at Winona Lake, Indiana. One Brethren in Christ minister and bishop even left his denominational posts to work for Youth for Christ! In other words, the “keep the youth” fervor that swept through neo-Evangelicalism in the 1940s and 1950s decisively impacted the Brethren in Christ, too. By the time the Jesus People movement emerged in the late 1960s, the Brethren in Christ were already profoundly shaped by a concern for meeting the needs of young people. Brethren in Christ young people began introducing “secular” music into the tradition by the late 1960s and 1970s. 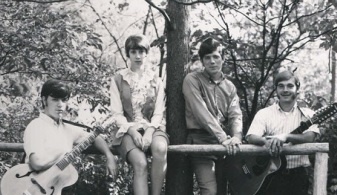 Evidence of Brethren in Christ young people introducing folk and rock music into the denomination’s musical oeuvre is evident as early as the late 1960s and 1970s. As we’ve previously discussed on the blog, Messiah College music groups — which often included Brethren in Christ students — began to form in these years. At least a few performed at General Conference gatherings, and perhaps even in Brethren in Christ congregations. So far as I can tell, these groups appear to take at least some of their inspiration from the Jesus People of the 1960s and 1970s, who — as previously pointed out — began to introduce folk and rock tunes into Evangelical worship services. More study needs to be done to determine what, if any, impact these new musical groups had on the musical styles of the Brethren in Christ Church at large. 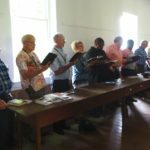 Did congregations begin to incorporate such styles (folk and rock) into their worship arrangements? If so, when? If not, why not? How did the church as a whole respond to young people’s musical innovations? Keep in mind that the Brethren in Christ Church as a whole only officially endorsed instrumental music in church worship settings in the 1950s. At that time most churches would have purchased organs or pianos — not guitars, tambourines, or other instruments such as those brought by these young folksy musicians. Introducing new musical styles into a tradition only beginning to express comfort with traditional church music would have been groundbreaking, indeed. Most Brethren in Christ churches today embrace some form of contemporary Christian worship music in their services. Like most other Evangelical congregations, most churches in the Brethren in Christ tradition have bought into the contemporary Christian music sound — music that blends rock and pop tunes to lyrics written from a Christian perspective. 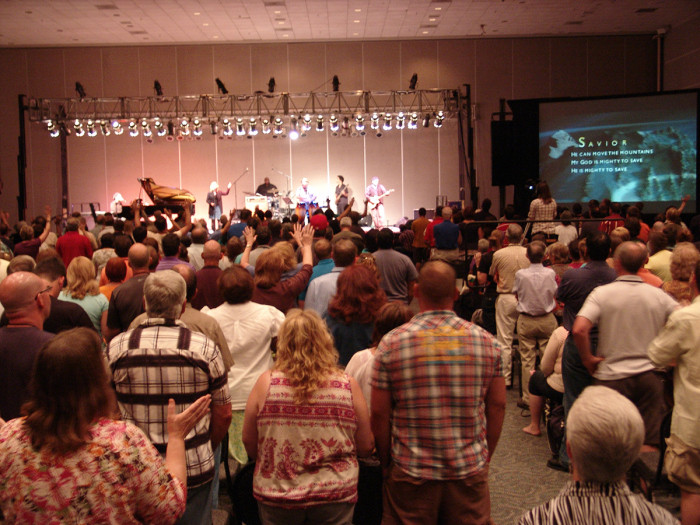 These musical styles often involve related elements, such as the worship band or charismatic expressions like raising hands or clapping during congregational singing. Eskridge has argued that these elements — contemporary music, worship bands, charismatic expressions during musical worship — first emerged during the Jesus People movement and have subsequently come to characterize the vast majority of Evangelical Christianity in America. In this regard, the Brethren in Christ are no different from most other Evangelical churches — and undoubtedly have felt the impact of the Jesus People movement as it has reverberated through history. I could share some other thoughts, but I’ll limit myself to these three. Look for my review of Eskridge’s God’s Forever Family — along with reviews of several other recent books on Evangelical history — in a forthcoming issue of Brethren in Christ History and Life. Devin – my dad and mom were “Jesus people hippies” or “Jesus freaks” who became Brethren in Christ pastors in 1974. My dad played his guitar and introduced folk music (he was a folk singer before he went to seminary) into a very conservative church (at that time). The result was several young families joined the church. My dad has remained a bit of a “pusher” on charismatic issues within the BIC for his entire life…including music. As the worship leader at Memorial Holiness Camp beginning in 1985 and staying in that role for more than a decade, he consistently worked to incorporate more contemporary styles of music, while at the same time maintaining hymns of the faith and acapella singing. It’s been a fascinating journey for him for the past 40 years! Jon: Fascinating! I’m assuming that your parents are still living. I would love to interview them at some point about all these issues you’ve identified here.